Pretty Pastels are everywhere right now! Pastel colors are perfect for springtime and remind me of Easter. There are a lot of great ways to incorporate pastel colors into your Wedding Decor. The trick is to keep it fresh and elegant to avoid it becoming too “babyish”, or on the other side too old. Try not to be super “matchy” with pastels, and incorporate modern elements and neutrals. 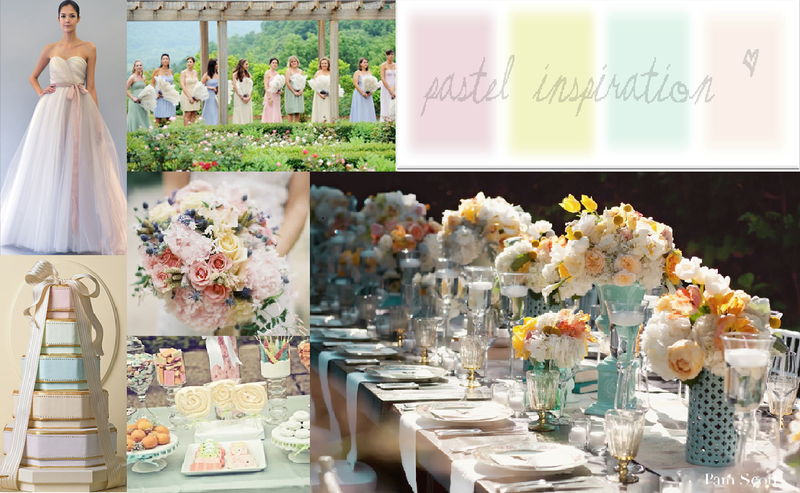 I created the Inspiration board below with this idea in mind, using Easter egg inspired colors, mint green, candy pink, soft yellow and peach. There are elements that tie everything together without going over the top with a theme, and a mix of classic and modern styles. The ribbon on the brides dress, wedding cake, and dessert table keep the look fun and girly. Bridesmaids each wearing a different color in the palette is a great way to make the style feel new. Lastly the tables lined with wedding centerpieces of varying heights and styled vases is a modern approach to the decor; with classic flowers in white, cream and pastel colors to keep the look soft.